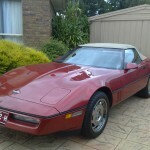 I got mine from a guy in the US off the Corvette forum Just sent him a email asking what could be done. He can either change your original chip or send you a total new one. I went the new option just in case I got told I needed to do a sniffer test. https://www.corvetteforum.com/ you will need to set up a profile and a password to make contact. However if you cant get on to him there are other people that do the same thing.